By GreenEyedLillies on December 18th, 2008 . Filed under: Announcements, Cupcake Ideas . I just noticed that ATC Celebrated it’s 1 Year Anniversary back on November 11th! 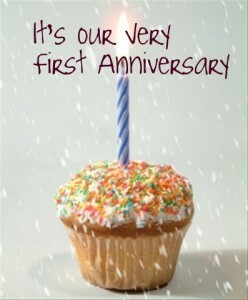 It’s been a year filled with “All Things Cupcake“. I have tons of wonderful memories from this past year. What are some of your favorite memories that you have had with us? What was your favorite ATC post? What do you hope the future ATC brings? Happy 1 year Anniversary ATC! I would like to thank Jess for creating ATC. I would also like to thank all of the contributors, readers, and fans who have helped make All Things Cupcake what it is today! One of my favorite memories is when Jess asked me to be a contributor on ATC. One of my favorite posts would have to be the one about the cupcake crib bedding. I just had a little girl not too long before this was posted and had to have the set for her! She is my cuppycake after all! I hope to see even more cupcake baby stuff. I would love to see a stroller, high chair, play pen etc sporting a cupcake theme!